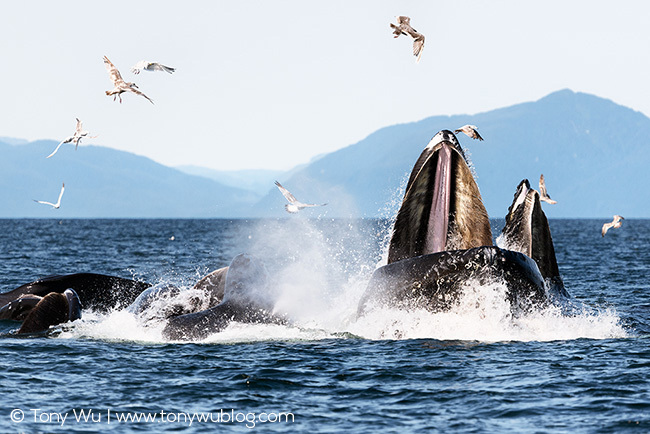 In between unpacking and re-packing, I've managed to grab a bit of time to process a few photos of humpback whales (Megaptera novaeangliae kuzira) from my recent visit to Alaska. The first is a breach at night. It was just before 21:30. The sun was low, just about to set, casting a warm yellow-orange glow across the ocean surface. 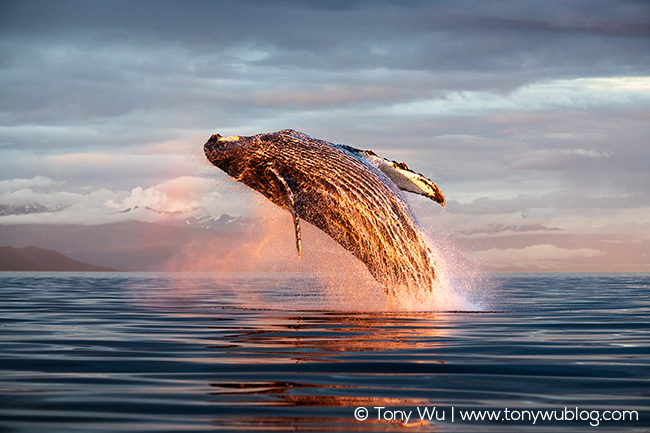 The humidity was high, and there was the hint of a rainbow developing in the background, visible in the photo behind and forward of the whale. I wasn't ready for this shot. No one was. The whale had breached a couple of times already, but too far to get a decent image, with the sun on the wrong side to boot. Jon sped up to reposition our boat, and seconds after he stopped, the whale came up. I reacted without thinking, just spun-and-shot without adjusting settings or focal length, or otherwise doing anything that a photographer is supposed to think about and do. Removing my brain from the equation worked well. The next image is another breach, this one from a special experience. 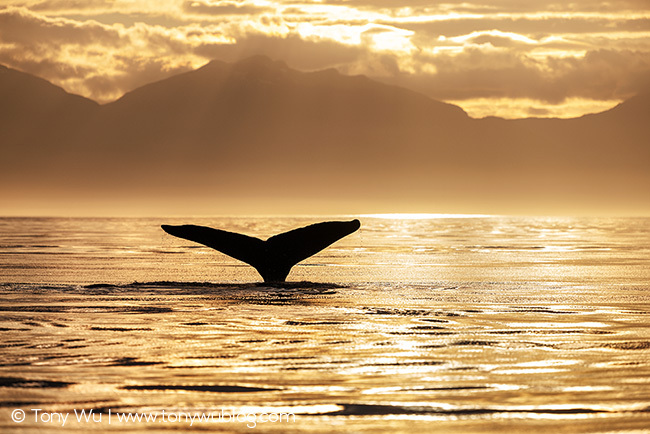 In short, we watched the break-up of a group of whales that had been bubble-net feeding together for several days. It was time to go their separate ways. 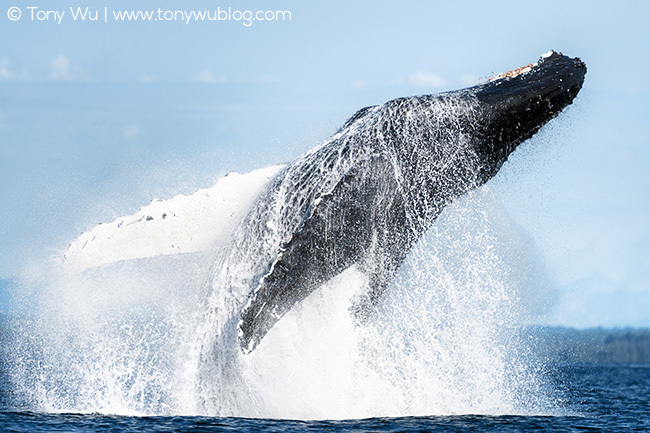 The whales punctuated their parting with an extended show involving multiple breaches and pectoral slaps. 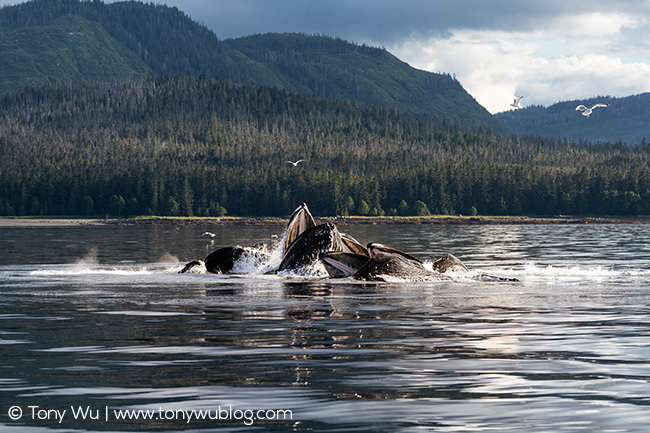 Next is a group of humpback whales engaged in bubble-net feeding. The last light of the day raked across the landscape at a sharp angle, casting shadows and imparting mood. It's a simple image, one that wouldn't be anything special in normal light. The warm cast of summer sunset is something I like though. I have more photos and more to say, but I'm out of time. Heading out the door again soon.